The Atomic Pro Force foosball table suits both teenagers and adults, and is catered more toward beginner players and those on a budget. For the price, it’s a good quality table, but you can’t count on having it for life. It would make a good foosball table for casual playing, but it’s no foosball table for running tournaments or professional playing, which requires something heavier, like the Atomic Gladiator, which we ranked as our 13th best foosball table overall. The wood finish gives the Atomic Pro Force a more traditional look, but the black legs modernize it with their sleekness and make it go well with everything. The black surface isn’t what you conventionally see on foosball tables, and it may seem a bit much considering that it has black players. But all-in-all, it has a fairly attractive look. You can’t expect a lot from a foosball table priced for less than 500 dollars. The minimum weight you should be looking at for a foosball table is 100 pounds, and the Atomic Pro Force exceeds that by only 8 pounds. This, of course, takes away from the sturdiness and stability and makes it less durable than other tables that can be a bit more expensive. Its 1-inch thick MDF cabinet’s girth is satisfactory, but the MDF’s quality isn’t the best. 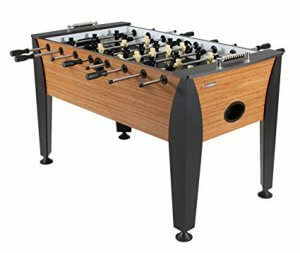 But then again, as we mentioned earlier, you can’t expect the best quality on a relatively cheap foosball table. It is made in China, and although that’s not necessarily bad (lots of the best tables are made there with great quality control), you can tell that this was made on a budget. It definitely lacks the finesse of a US-made table. The Atomic Pro Force foosball table is 56 inches in length, 29 inches in width, and 34 inches in height. It weighs around 108 pounds. Being fairly light, it’s not that hard to move around (or out of the way) if you don’t want it in the middle of the room all the time. The adjustable leg levers are useful in case you have two types of flooring, or a rug, and need to stabilize the game. Just because the Atomic Pro Force isn’t the most durable foosball table out there doesn’t mean its gameplay isn’t good. On the contrary, it’s still quite a solid table. Now, it is built for children, teenagers, and beginners, so isn’t quite suitable for aggressive or vigorous gameplay, but it holds up well to a decent match with some friends. The table is generally well-leveled. The levelers do help, and so does the half-inch surface. As is well known, the thicker the surface, the more level the table would be. The sides of the table are equipped with a buffer so the ball keeps rolling. This keeps the fun going and doesn’t allow dead spots to interrupt the gameplay. The hollow rods are light and thus deliver faster gameplay. However, they don’t come with ball bearings, so their operation may not be as smooth as expected. This doesn’t seem to be a huge problem for beginners or children, though. Ball returns are more convenient if they’re placed on the side, but unfortunately, they’re placed on both ends of the Atomic Pro Force. Not a huge issue, obviously, but something to note. This means you’d have to move around to bring back the ball after each goal is scored. So to conclude, you can’t dismiss the Atomic Pro Force foosball table for its price. If you’re a beginner looking to advance, make progress and become better, then the Atomic Pro Force foosball table is for you. It’s also a good choice for someone that is going to use it recreationally or is buying it for their kids or teenagers. However, if you’re looking for more serious gameplay and a more durable table that would sustain and endure energetic games, you should be willing to expand your budget a little and should be checking out other foosball tables like the Tornado Classic or Tornado Sport foosball tables.